Last year was so busy for us we missed our 10-year anniversary/birthday celebrations. This year instead we plan to celebrate our survival and journey over the past 11 years. Including through a series of blogs on 11 of the most important/biggest lessons we have learnt since we started Blick in 2008. 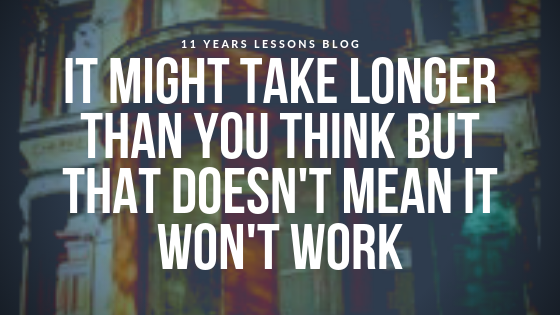 It might take longer than you think but that doesn’t mean it won’t work. Starting a business is often a longer journey than most people think. Someone once told me it takes an average of 5 years for a new business to become reliably successful. Certainly this time frame was accurate for us with Blick and most businesses I have come across. Accelerators, incubators, business programs and talk of high growth start-ups and rare examples of super successful business people can lead you to think you are failing if your business isn’t successful within the first couple of years. In my experience this isn’t the case. As long as you are making progress and the business is growing (even slowly) and you are happy to continue the journey and aren’t getting yourself into financial difficulties there is light at the end of the tunnel. Things will (hopefully) get easier and all that hard work building your dream business will be worth it. Staying motivated during this period can be hard. The initial excitement of starting your business has likely worn off and the challenges and realities of self-employment are setting in. What helps me to keep motivated is to focus on small achievable tasks. You can’t make people buy from you or make your business become successful overnight. But what you can do is take small steps to slowly push your business forward. Set up meetings, get involved with collaborative projects, apply for opportunities etc. This process helps me to maintain a positive forward thinking mindset rather than slipping into a negative mindset and focusing on things I cannot control. I also find it helps me to stay motivated if I focus solely on my own business and journey and not get side-lined into looking at the competition. I think its important to remember everyone is following their own path. There will always be people who seem to have more money and opportunities and an easier journey to success. But at the same time there will be others with less who will be looking at you and wishing they had what you have.